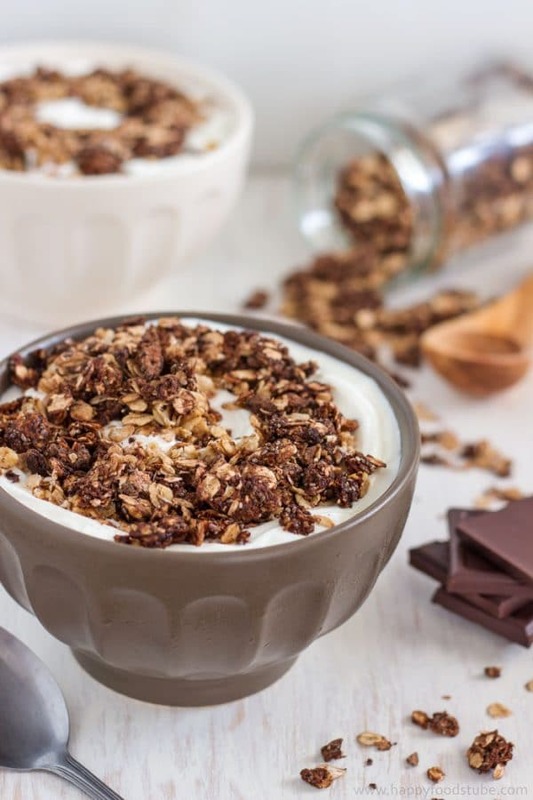 This is an easy recipe for super healthy homemade granola. 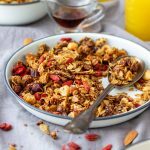 A tasty mix of nuts, seeds, oats and dried fruits with a hint of coconut and honey. 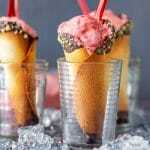 Enjoy with yogurt, fruits or milk! 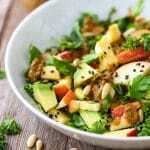 Make your own version of this super healthy breakfast option. 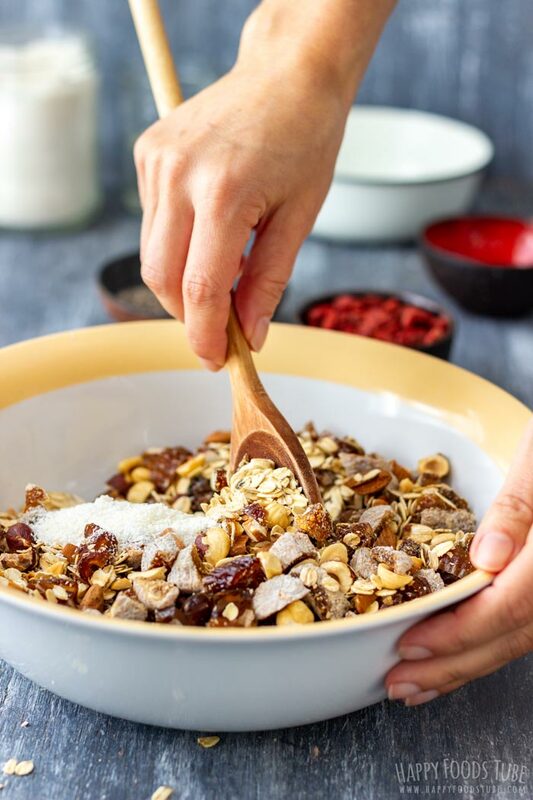 This one of the recipes where you can experiment and add your favorite nuts/seeds or dried fruits to make it the way you like it. Try it once and you won’t go back to the shop-bought granola! 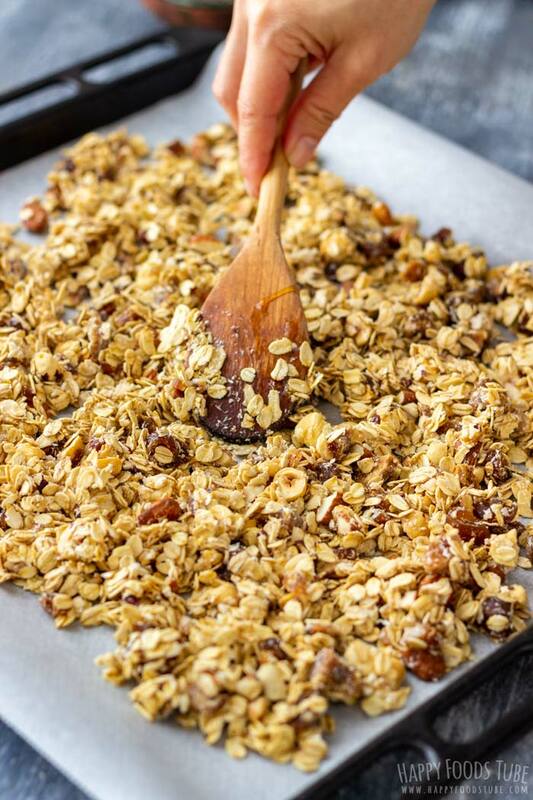 This super healthy homemade granola makes for a great and tasty Christmas present as well! 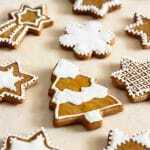 All you have to do is pack it nicely, add some festive tags and ingredient list and you can surprise your friends with Homemade Edible Christmas Gifts. 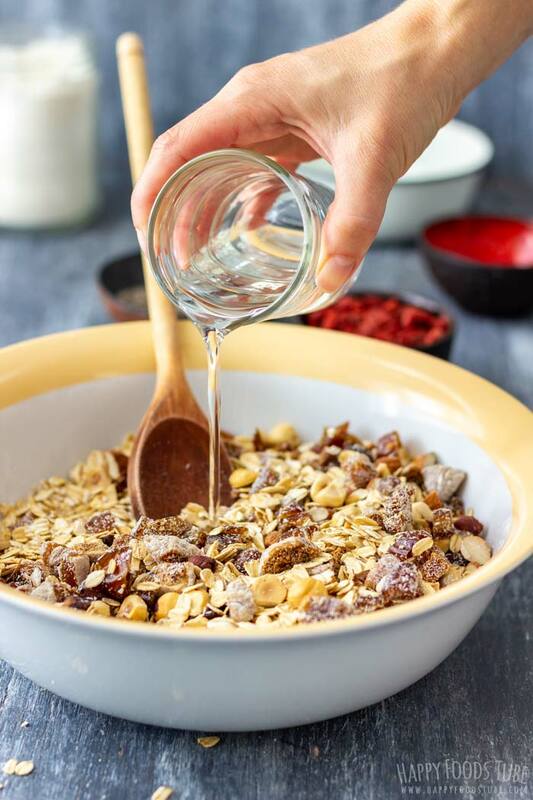 How do you make healthy granola? First of all, preheat the oven to 300°F (150°C). Then, prep the nuts and dried fruits by chopping them (roughly). When you are done, transfer these altogether with oats, salt and coconut into a large bowl. I like to give everything a good stir before I pour the coconut oil and honey over. Again, mix everything well until all the ingredients are coated in coconut oil. Transfer the mixture onto a baking tray lined with parchment paper and spread it around evenly. 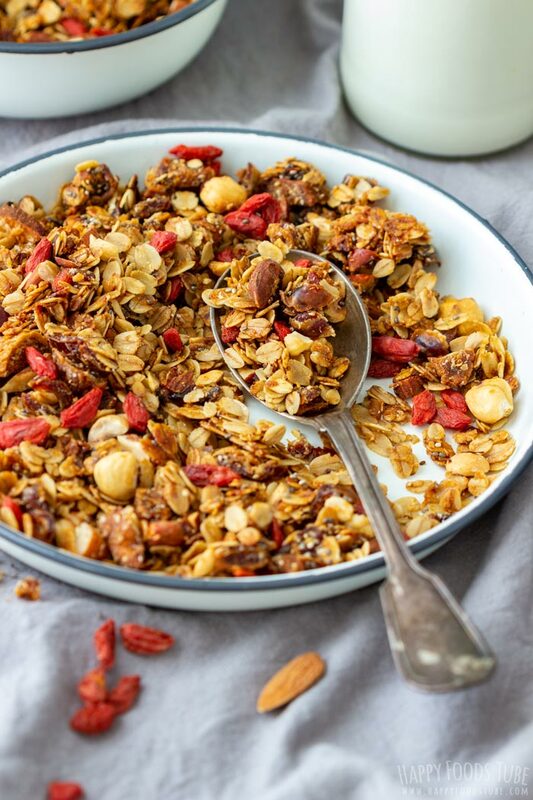 Super healthy homemade granola is baked in the oven for about 15-20 minutes. During the baking you need to stir it a few times (2-3x). 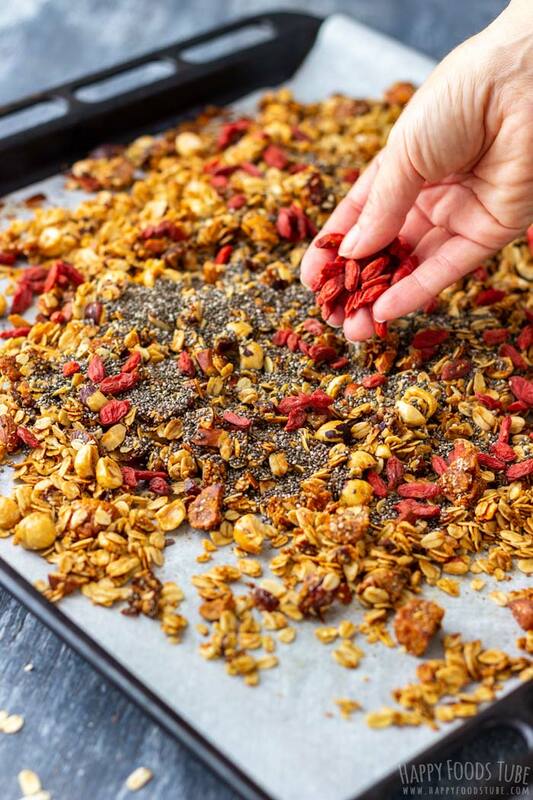 Mix the baked granola with chia seeds and goji berries and let it cool down completely. Store in air-tight container! For those who love chocolate I recommend trying Dark Chocolate Granola! 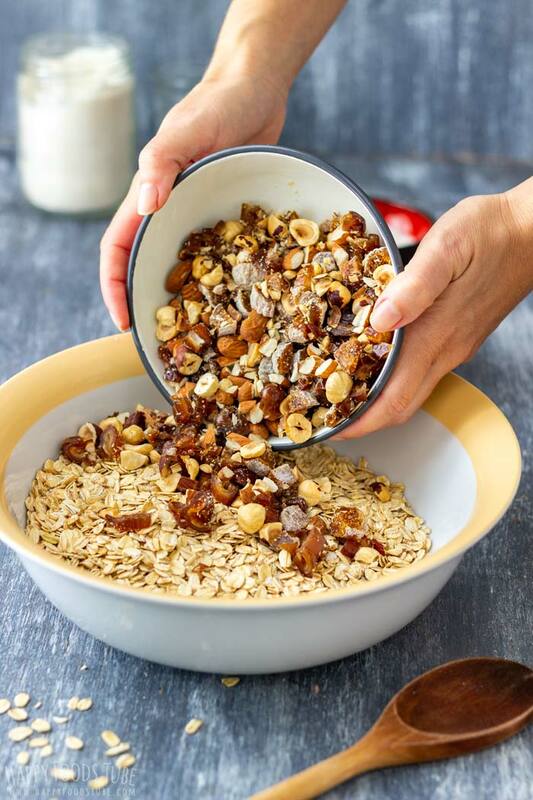 They are pretty similar when it comes to ingredients (nuts, seeds, dried fruits, oats, …). However, muesli is unbaked while granola is baked which is the main difference between the two. 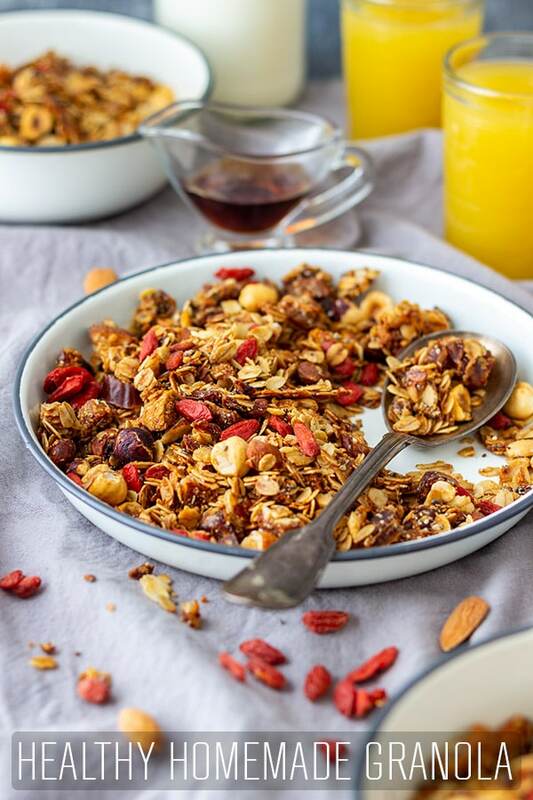 What is the healthiest granola? It’s definitely the one you make from scratch at home. You know what you put in and you can easily “regulate” the amounts of each ingredient. Make sure not to burn it. It only takes minutes from being done to being burnt. The best thing is to keep an eye on it, especially at the very end. Also, don’t forget to stir is several times during baking so that the even the bottom pieces bake evenly. 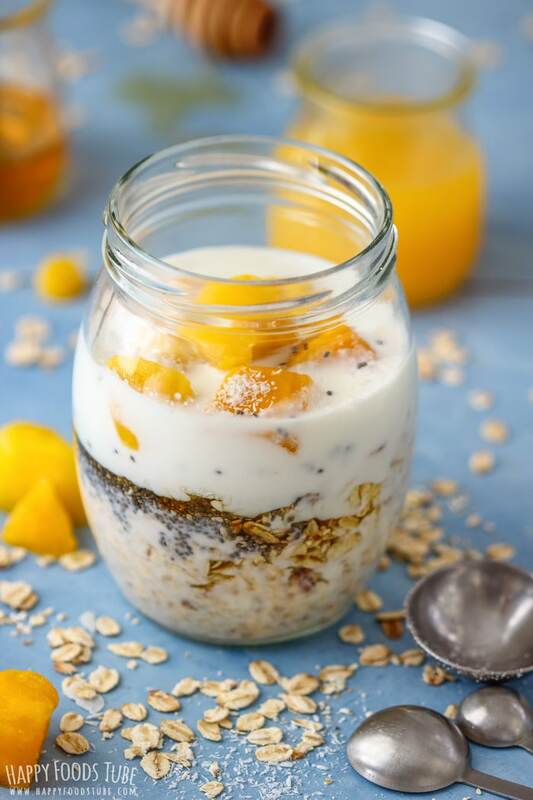 If you don’t like granola or chia seeds or don’t have them on hand, you can omit them. This super healthy homemade granola has just the right amount of sweetness. However, every person is different so if you like it sweeter, go ahead and add more honey. To keep this recipe super healthy, I don’t recommend substituting coconut oil with sunflower or vegetable oil. Meanwhile: In a large bowl, combine the oats, salt, and roughly chopped figs, hazelnuts, dates and almonds. Add coconut and mix everything until well combined. Pour in the coconut oil and mix until all the ingredients are well coated in it. At last add honey and stir. Transfer onto a baking tray lined with parchment paper, spread the mixture around and transfer to the oven. Bake at 300°F/150°C for 15-20 minutes. Stir 2 or 3 times during baking so that everything bakes evenly and the top doesn’t get burnt. When ready, take it out from the oven and stir in chia seeds and goji berries. 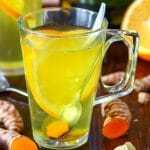 Let it cool completely before transferring it into an air-tight container. 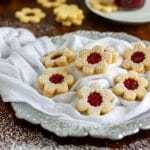 Enjoy with milk, yogurt or on its own! The amounts of ingredients can be adjusted to your liking. Do not reduce the amount of coconut oil. 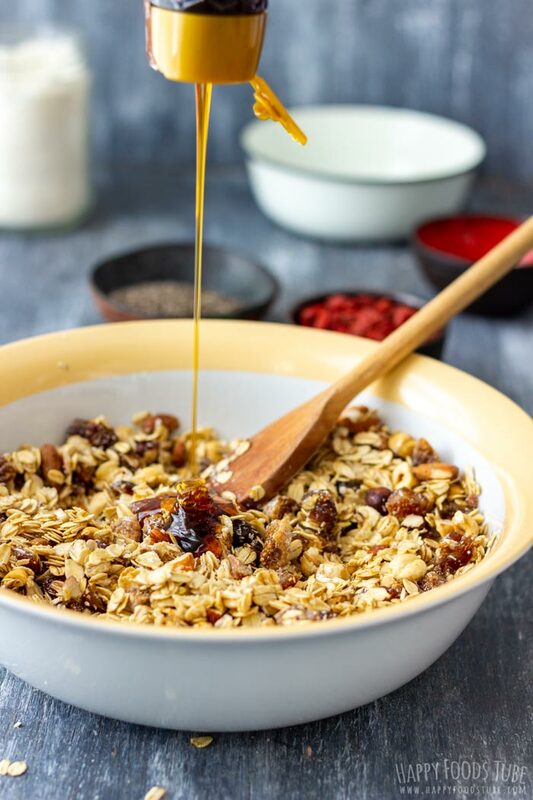 Honey – if you like your granola sweeter, add more honey. Coconut oil – coconut oil can be either solid or liquid. This depends on the temperature in the room you keep it in. If your coconut oil is solid, melt it first and then measure ⅓ cup. I used measuring cups for dry ingredients to measure the liquids as well. Desiccated coconut is similar to shredded coconut, just drier. 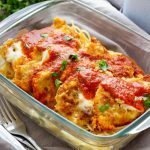 Store in an air-tight container in your pantry or in freezer. When keeping it in the freezer, let the dried fruits thaw before serving. The baking time may vary slightly depending on your oven so keep an eye on it when making it for the first time. I usually have yoghurt for breakfast but this would be delicious with the granola. Looks full of tasty ingredients! 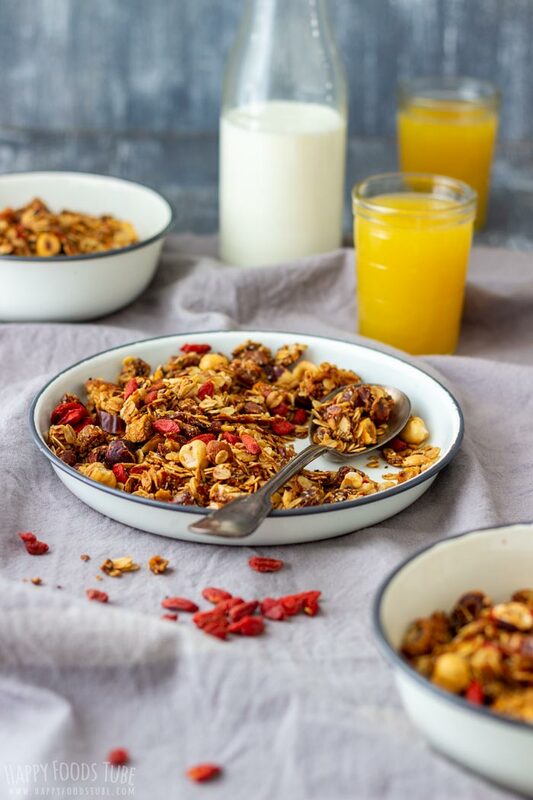 I make this granola all the time, it’s sooo good! I use maple syrup instead of honey and add lots of spices like cinnamon, ginger, nutmeg, cloves. Yum! I like the idea of using spices! Will give it a go next time! I’m thinking there is nothing better than homemade granola. 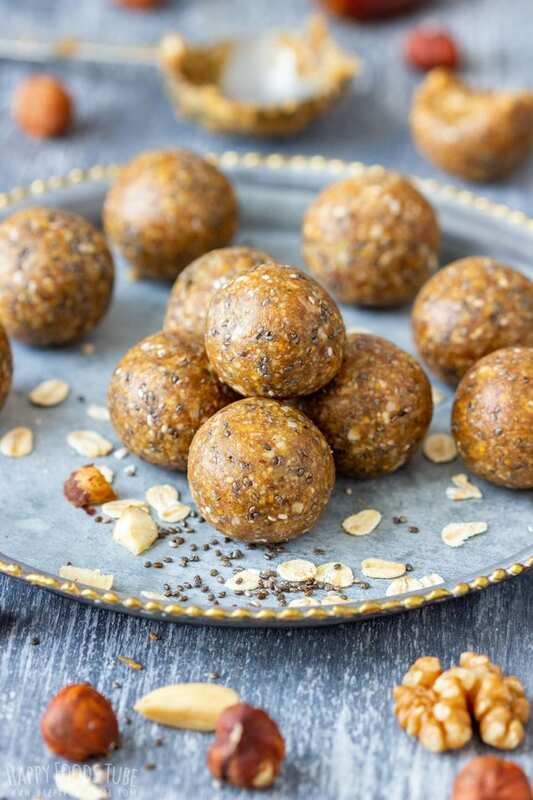 Not only is it delicious, but you can use healthy ingredients and control everything about it! 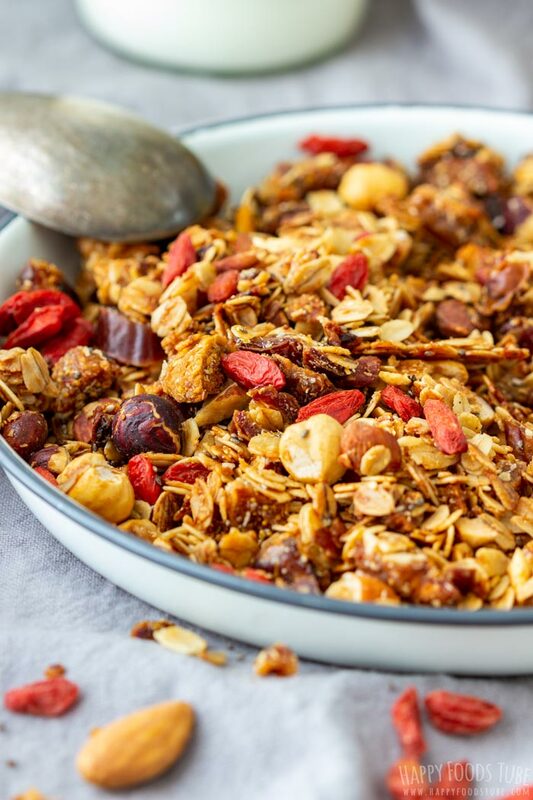 This granola looks fabulous! This looks just delicious! I was mesmerized by the process shots lol. I haven’t had granola in years but this just looks so good. You gotta try it, Carmella! Homemade granola is the best! 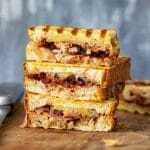 These ingredients are all so healthy but also so tasty together – great recipe! 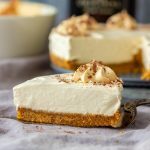 Simple and easy and delicious! I used your recipe as my base, and I added a few more nuts/seeds to create my own version. This is wonderfully simple and tasty! Again, thank you for posting!